Runners, do you recognize this face? He’s a familiar face at pretty much all the road races in Jo’burg as well as Pretoria. He arrives at the race long before majority of the runners and sets out all his goodies. It’s mostly running shorts, carbo loading sweets, cool drinks from the back of his bakkie and running gloves (which have saved me before on an icy Winter morning). His name is Mens Moosa and he’s been a friendly face at the races for the last 25 years! Mens says his love is mainly for ultra marathons and boasts 25 Comrades medals to his name. I did not realize that 5 minutes before the start of the races, he quickly packs up all his goods and manages to get to the start line to run the race with everyone else. When you do see him next time, say hi! No race is the same without seeing his face! Thanks Mens! 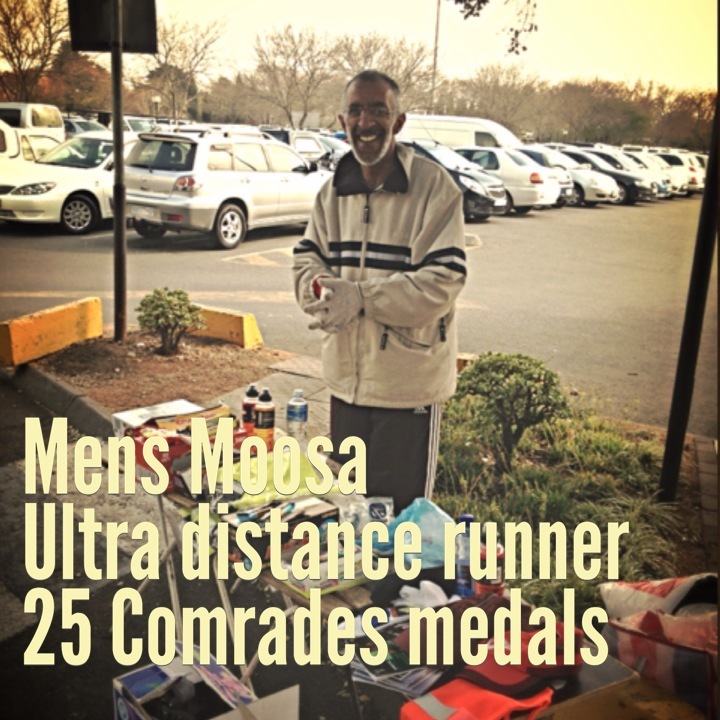 This entry was posted in My Races and tagged Central Gauteng, johannesburg, Mens Moosa, Pretoria, races, running by Bo. Bookmark the permalink. Sounds fantastic! Looking at the racing calendar, my next race is possibly going to be the Fred Morrison in Germiston on 15 Sept (depending on how my fast goes the previous day). You going to be there? I’ll definitely wave and say hi next time 🙂 Thanks for the introduction!